Colorlab staff often work with damaged prints. In addition to working with clients on preservation projects, Colorlab staff regularly provides outreach by attending archival conferences and conventions such as AMIA, The Orphan Film Symposium, and The Flaherty Film Seminar, often participating in technical discussion panels. The company occasionally takes on interns, but the high learning curve that goes into training and education is often a deterrent. Currently, Colorlab staff are working on several high-profile projects, including preservation of original production and interview outtakes from the civil rights documentary Eyes on the Prize, a documentary about Carnegie Hall’s 1986 renovation, The 28-Week Miracle, and a film called Nenotri I Dyte (The Second November), for the Albanian Cinema Project, an effort to introduce historically-isolated Albanian cinema to global audiences for the first time. Additionally, Colorlab recently provided archival transfers to Ken Burns for his upcoming 7-episode documentary, The Roosevelts. Started as a “weekend hobby” in 1987 by husband and wife team Dennis Doros and Amy Heller, Milestone Films has since become a renowned distributor and preserver of classic film, documentaries, and independent cinema. “We are not always prudent and we are hardly ever commercial, but we pride ourselves on being passionate, ridiculously over-researched and persnickety about sound and image quality,” Heller says. 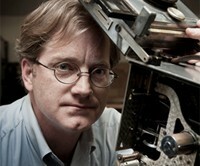 Doros’ involvement in preservation began while employed at Kino International, during which time he oversaw the restorations of silent films Queen Kelly and Sadie Thompson. Heller, who studied labor history at Yale, entered the field after working for First Run Features, an independent distribution company that carries social and historical documentaries. Having worked together for three years on a series of film restorations they later named “The Age of Restoration,” Doros and Heller founded Milestone in 1990 after discovering that other distribution entities were not interested in releasing the films. Doros, who was voted to the Board of Directors of the Association of Moving Image Archivists in 2008, notes that making connections with others in the field “[has] led to a lot of our acquisitions. We have experienced amazing generosity from our friends (especially with bonus features) that have greatly enhanced our love for the field – and our company’s reputation. The friends we have met and the support of the archives and archivists is really important to us.” As a rule of thumb, Milestone preserves films that can be seen many times (“because that is what is required for successful distribution,” Heller says), that actively work as cinema (incorporating the tools of the camera, movement, sound, and editing), and that tell a story or retell history from an underrepresented viewpoint. “Films from the past often have an emotional and political power that is just amazing. I love when we can re-discover, restore and release films that still speak to audiences today,” Heller says. Currently, the two are working on preserving several American Indian films, including In the Land of the Head Hunters, Daughter of Dawn and Sherman Alexie’s The Business of Fancydancing. They are also working on the films of Barney Rosset (the founder of Grove Press) and Kathleen Collins, and are continuing work on Project Shirley, their series of restorations of Shirley Clarke’s films and unfinished works. “We’re always excited about the next project and we have a lot going on now,” Doros says.